"But I use the power of God to force out demons. This shows that the kingdom of God has come to you! When a strong man with many weapons guards his own house, then the things in his house are safe." Jesus' power is God's power demonstrated. 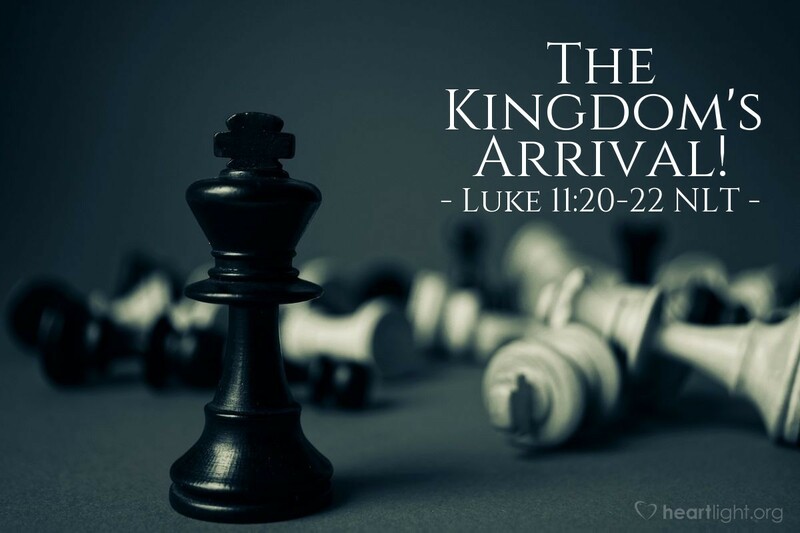 Jesus' power is Kingdom power on arrival. Jesus' power is stronger than Satan's power and enables the Son of God to triumph. Jesus' power is our assurance of ultimate victory, deliverance, and salvation. Satan's most treasured "belongings" or treasures are stripped from him and carried away to glory. Those treasures are us! Thank you, dear Father, for the victory that you won for me in Jesus. Thank you for Jesus' triumph over sin and death. Thank you for rescuing me from the hands of the evil one. Now, dear Father, please give me the courage and the will to stand up to his temptations and assaults knowing that the victory is mine through Christ Jesus my Lord, in whose name I pray. Amen.